Tapered bore in-line indicators for flow rate. Ideal for high purity or corrosive liquid applications, gas and liquid applications, air samplers and medical applications. Flowmeters are shipped assembled and ready for panel mounting. 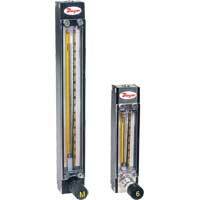 Rate-Master® Polycarbonate Flowmeter is suitable for both gas and liquid applications. Allows the piping to remain undisturbed, interchangeability of the ranges, and easy cleaning. 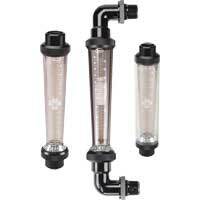 Visi-Float® Acrylic Flowmeter is a clear acrylic body flowmeters suitable for both gas and liquid applications. A few applications are medical equipment, air samplers, gas analyzers, and chemical injectors. 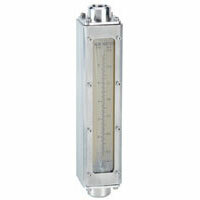 Visi-Float® Acrylic Flowmeter is a clear acrylic body flowmeter suitable for both gas and liquid applications. A few applications are cabinet purging, remediation, and osmosis skids. 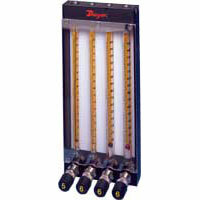 High Flow Glass Flowmeter offers a solution to the problem of fluid flow indication at higher capacity levels. Designed to withstand even the harshest industrial applications. Variable Area Fluoropolymer Flowmeters are ideal for high purity or corrosive liquid applications. Applications include chemical injectors and deionized water systems. Rotatable Scale Flowmeters are ideal for the direct flow measurement of air, water, and other commonly used gases. Features borosilicate glass tubes. An application is water and air pollution analysis systems. 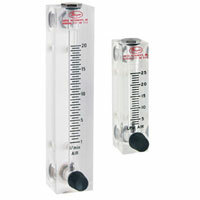 Variable Area Glass Flowmeters are designed with easy to read scales. Suitable for metering carrier gases, liquid, and gas measurement in pilot plants, process flow, and level indicating. All Fluoropolymer Flowmeters offer solutions for measuring flow rates of highly corrosive or ultra-pure liquids. Applications include chemical injectors and deionized water systems. 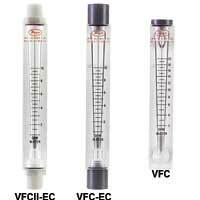 Direct Reading Glass Flowmeters are ideal for direct flow measurement of air, water, and other commonly used gases. Shipped completely assembled and include standard panel mounting hardware. 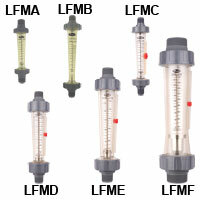 Mini-Master® Flowmeter is suitable for both gas and liquid applications with advanced features at a low cost. 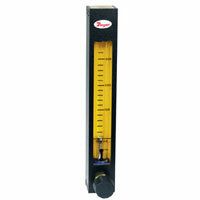 Compact flowmeter ideal for measuring small volume air. Ultra-View™ Polysulfone Flowmeter is a laboratory grade flowmeter with a dual scale that measures flow in GPM and LPM of water, air, and other compatible media. Multitube Flow System can be configured with up to six different flow tubes with various flow capacities and flow patterns. Ideal for multichannel metering, mixing, or monitoring applications. Industrial Direct Reading Flowmeters are directly measure flow rates for water and for air service. Applications include gas or liquid metering and industrial pneumatic or hydraulic systems. 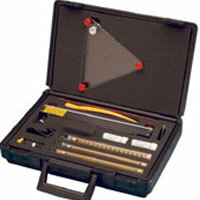 Variable Area Flowmeter Kit is economical. 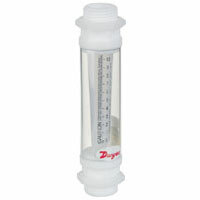 Includes a completely assembled flowmeter and three interchangeable flow tubes. A few applications include air and water analysis, film processing, and pharmaceutical. 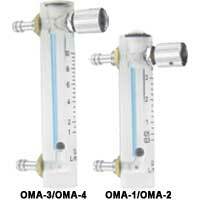 Oxygen Flowmeter is for medical applications and manually controlling flow from oxygen generators. Flow levels are kept stable by precision valve and knob adjustment. Polycarbonate Flowmeters are made of precision, injection molded polycarbonate bodies and fittings. 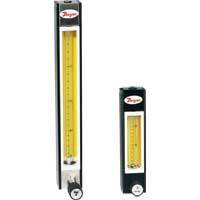 They feature dual, direct reading scales measuring in both GPM and LPM. Regulator Kits are available as optional extras. 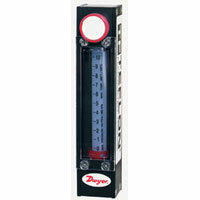 The standard regulator may be used with any Dwyer Series RM or VF flowmeter. 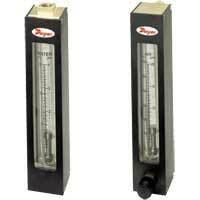 How are Dwyer flowmeters properly read? The flow rate is read at the maximum width portion of the float regardless of shape. What factor is used to correct for different flowmeter inlet pressure? If the flowmeter is exhausting to atmosphere, no correction factor is needed. If back-pressure is present due to downstream plumbing or restrictions, this error can be corrected utilizing the conversion curves in our full-line catalog or the following equation. Why are top mounted valves recommended for flowmeters used for vacuum service? To maintain atmospheric pressure in the indicating bore and therefore preserve accuracy; an inlet restriction would reduce pressure in the bore. This is essentially the opposite situation to outlet back-pressure in a pressure system which increases pressure in the bore and also affects accuracy. Remember that all standard Dwyer flowmeters are calibrated for standard atmospheric pressure and temperature in the bore. 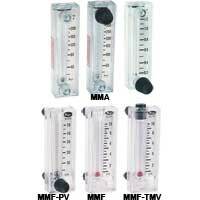 Is the Rate-Master® or Visi-Float® Flowmeter compatible with any media? The Rate-Master® Flowmeter is manufactured from a polycarbonate plastic and the Visi-Float® Flowmeter is manufactured from acrylic. Compatibility charts need to be reviewed to determine if these materials of construction are compatible with your media. 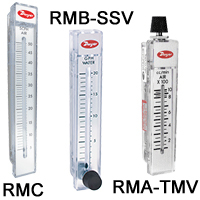 Are special ranges available for the Rate-Master® and/or Visi-Float® Flowmeter? Yes, other ranges are available which are not specified in our catalog. Please feel free to contact Dwyer with questions on these ranges.